Mike Taylor noted in a blog post that in the book Programming Pearls it is mentioned that no more than 10% of developers can correctly implement a binary search. Appalling! As I’ve found myself using Ruby more and more lately, I thought I’d try to implement the binary search using that language. The script includes code to run the binary search through the test cases for the exercise created by Steve Witham. And once the file reading worked - all tests actually passed (or the code incorrectly shows them as passed… ;). Like all cool kids blogging nowadays, as part of the attempt to rejuvinate the blog, I’ve switched to Jekyll. Or, rather, the extended fork Octopress. As part of the migration I wanted to extract all the old posts from Wordpress into the proper markdown format used by Jekyll. Jekyll includes a migration script for Wordpress, but this used a direct database connection to the Wordpress MySQL server to extract a minimum amount of information for each blog post. To avoid missing information that I later might want after having shut down the Wordpress server, I wanted to base the migration on a full XML export from Wordpress. This way I could go back and extract more information from the old posts, if, and when, needed. Seeing this as a chance to play with Ruby - a language I’ve only dabbled in previously - I set out to build a simple Wordpress XML->Jekyll converter. The converter reads the Wordpress export and converts all blog posts into separate files with a proper Yaml frontmatter. It also converts the syntax highlighting markup, code markup and headings into the corresponding markdown conventions. The rest of the HTML is left alone. For the images I just copied the files in the old Wordpress structure into the new blog directory layout so that the URLs still match. Not the nicest way, but I was too lazy to do anything about it just yet. Anywho - the source for the Wordpress XML converter is available in the blog branch of my fork of Octopress. The source is also given below. To use, just run with the filename of the Wordpress XML export as the first argument. It’s my first publicly available Ruby program - so be careful. Improvements welcome! For that fresh new feeling I switched this site from Apache2 to Nginx. A quick compile of the source package and following the instructions on hooking it up with Wordpress over fastcgi using php-cgi and we’re done! Feels good with a server handling the C10K problem - and it has a fairly decent configuration language IMHO. Will post more about this later! More than a full year since last post - this might not be working as well as I had hoped…! Finding the time and inspiration to write between the day job and private commitments turns out to be a challenge. Instead of seeing this as a failure, however, I will try to learn from the experience and attempt to find a new way of relating to the blog. Perhaps by being less long winded (!) in each post I could get a few more out there. There are still a lot of things going on I would like to capture, but the previous form is clearly not working. So - let’s try to shake things up and see how that works! This time we will finally get the Ioke source code, build it, and test the Ioke REPL! Ioke uses Git as the source code versioning tool, with a public repository set up on GitHub (soon I’ll be linking like Jeff Atwood). remote: Counting objects: 9221, done. remote: Compressing objects: 100% (2941/2941), done. Receiving objects: 100% (9221/9221), 45.95 MiB | 399 KiB/s, done. Resolving deltas: 100% (5782/5782), done. Running just ant will execute the default target in the build.xml file. This target will make sure Ioke is compiled and the test suite is run. At the end is a summary of the test results - if these are not all successful you might have a problem with the environment or you might have checked out a broken build from the repository. Here we create a Text (Ioke’s string type) literal and send it the message println, which will cause the text to be printed to the console. The return type of println is nil (similar to null), which is printed by the REPL itself. After that we get the prompt back and can execute another line. Note how the REPL prints the method definition in a canonical form - it makes it obvious how Ioke parses the code, what are messages and what are arguments. Ioke handles arbitrarily big numbers, so we don’t need to think about what fits in a certain number of bits. The above output shows that when we try to reference something that doesn’t exist we get a chance to provide that value. Here I decided to provide a value using the useValue restart and entered the value 5. This let the method continue executing and the result was printed. Next up are the Emacs modes for Ioke - stay tuned! It took a bit longer than anticipated to get to this point, as I got side tracked with the Ioke type checking activities. But now when Ioke S is out we can continue with the series. So! We’re getting closer… Only a few more things to go. As the current version of Ioke is implemented to run on a Java Virtual Machine, we need to get hold of one of those to be able to continue. The JVM brand we will install here is the latest stable one produced by Sun. What we need is Java SE Development Kit 6u11 for Linux, Multi-language, and the the filename for this is jdk-6u11-linux-i586.bin. Note that this is not the .rpm.bin, which is also available. Download the file from http://java.sun.com/javase/downloads/index.jsp (I’m sure you can find it) and put it in the ~/work directory. That done - let’s move on to Ant. Ioke uses Apache Ant to handle the build process, so to build Ioke we need to get Ant installed. Soon to come: How to get the Ioke source and build it. Ola Bini recently issued a call to arms to help with the receiver and argument validation for Java methods in Ioke. These are the Ioke methods that are implemented in Java, instead of in Ioke itself. The Java methods usually operate on the specific data contained within Ioke objects. This data corresponds to different Java classes, depending on what the Ioke object should hold. For instance, an Ioke List contains inside the data area a Java List. To operate on this List the Java code needs to get hold of the List reference - and it does this in a lot of cases by assuming the data object is of a certain type and casts to this type. If the data object is of a different type then a Java ClassCastException is thrown, which makes the interpreter quit. Since Ola mailed the call to arms a number of things have happened. A few people (including myself) have volunteered to help out with adding the validation code. Additionally, a few supporting methods and additions have been added to the Ioke code base to simplify adding type checks to the existing code. And it’s these additions that I will talk about here. As an example what the new type validations can look like I will use the List + method that Ola also mentioned in the example. When using these to define the Java method we can “annotate” the arguments definition with types for both the arguments and the receiver. By then implementing the appropriate activate(...) the super class takes care of evaluating and validating (converting as appropriate) the receiver and arguments. Note that most of the boiler plate code for arguments handling (which most JavaMethods do) is removed, leaving a clean implementation of the necessary logic - to concatenate two lists in this case. 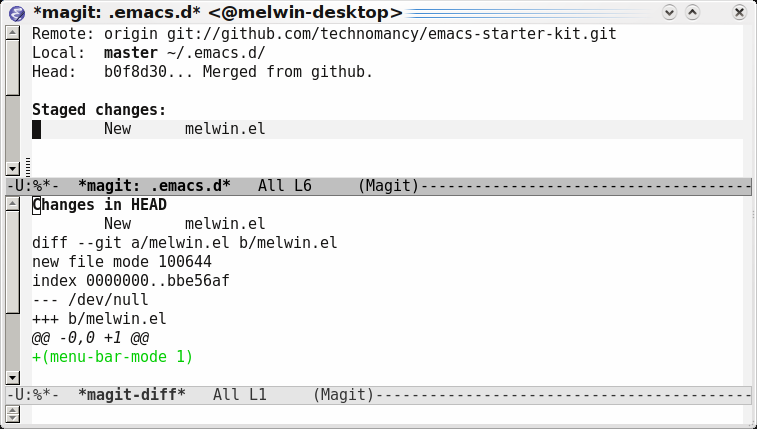 In this post we will install GNU Emacs from source and also get a basic configuration set up using the emacs-starter-kit. If you already have Emacs installed and have an old configuration laying around you probably want to make a backup of this before following the below instructions. This post assumes that there is no Emacs installed and that the user doesn’t have any Emacs configuration in the home directory. Git is an efficient Distributed Version Control System. 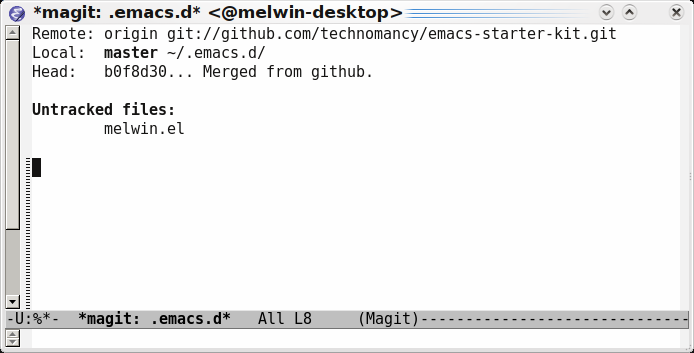 Although the primary VCS for Emacs is still CVS - and it looks like they are moving towards Bazaar - we’ll get the Emacs sources from the Emacs Git mirror. We want to be cool, right? remote: Counting objects: 46400, done. remote: Compressing objects: 100% (24410/24410), done. Receiving objects: 100% (46400/46400), 74.38 MiB | 213 KiB/s, done. Resolving deltas: 100% (41204/41204), done. Checking out files: 100% (2837/2837), done. With the --depth 1 parameter we limit the history so that we only get the latest version of the files - in this case we’re not interested in the full history. Note: As we’re getting the bleeding edge source code of Emacs, it could happen that the build is broken. I’ve never had this happen on me, but in case you get strange errors when building Emacs, this might be the reason. Usually such problems are fixed quickly, so try to do a git pull a bit later to update the downloaded source. Phew. That burned som CPU cycles…! Once done - let’s add it to our bin directory, just as we did with Git. This should show you an Emacs window with a pretty(?) GNU. 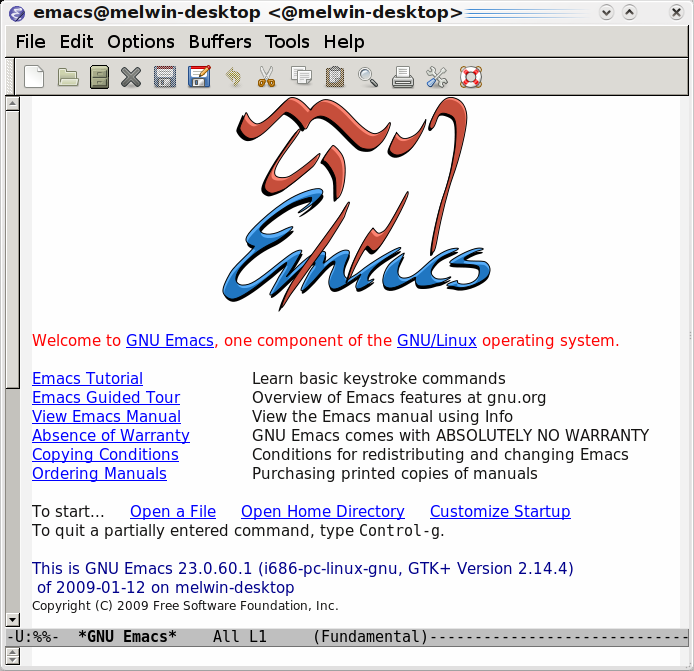 If you’re completely new to Emacs, this might be a good opportunity to run the Emacs tutorial. Emacs is a self-documenting editor, which means that most things that you might want to learn about Emacs can be found inside the editor itself - including information about internal functions and libraries. To run the tutorial, just press Ctrl+h t (that is, control and h, release control, then press t), or, in Emacs lingo, C-h t (which is the convention I’ll use from now on). Once you’ve learned enough (you did complete the whole thing, right? ), just quit using C-x c.
Note: To update the source code and rebuild, do a git pull in the emacs directory, then make distclean (in case some build files changed) and then perform the compile and installation as per the above again. Next up is emacs-starter-kit to get more functionality in Emacs and a decent default configuration to help us get going - stay tuned! In this series of posts I will guide you, the humble reader, through the install procedure to get a development environment for Ioke up and running. All the cool kids want to develop in Ioke nowadays, so let’s make you can as well! These instructions are written for a non-expert who might not have too much experience with compiling things, using Git or Emacs. If you’re an expert you will find nothing new or exciting here! The environment I use is a freshly installed Kubuntu Intrepid Ibex box, although most of it should be similar, if not identical, to other Ubuntu/Debian based distributions. The components listed above will all be installed manually - not using the package system. This is to allow us to get the freshest versions of what we need without depending on the packages in the distribution to be updated (or hunted down in alternative repositories). The only thing we will install from the distribution are the compilers, tools and development libraries used to compile the software. If packages are used we will depend on the repositories to be updated to use the latest version of some software, which can be annoying if we want to develop on the bleeding edge. It’s good to know how to compile things yourself - so by not using prepared packages we might learn something! To keep control over our custom built software we’ll install it in dedicated directories under $HOME/opt instead of in the normal locations like /usr/bin. This allows us to get everything installed without needing root access (except to install the compilers etc from the distribution). Always sound advice to start with - especially if you are hitchhiking. I’m going to try to cover each step in detail, but if you think something is unclear - just leave a comment and I’ll try to clarify. So - grab your towel and let’s get going! For Emacs, emacs-starter-kit and Ioke we will use Git to retrieve the sources. Therefore the first thing we need to install is Git. In the command line instructions below, all lines prefixed by the prompt &lt;dir&gt;$ are commands to be typed in. The rest are output or my comments. Open a terminal window and create a new work directory under your home using the following instructions. In this directory we will work with downloaded source files and build the software. The last command downloads the git source package and expands it in one go by piping it directly from wget to tar, which is told to expand it using bz2 with the j parameter. This is a convenient way to get packages off the net and unpacked, especially when there is no need to keep the package itself around. 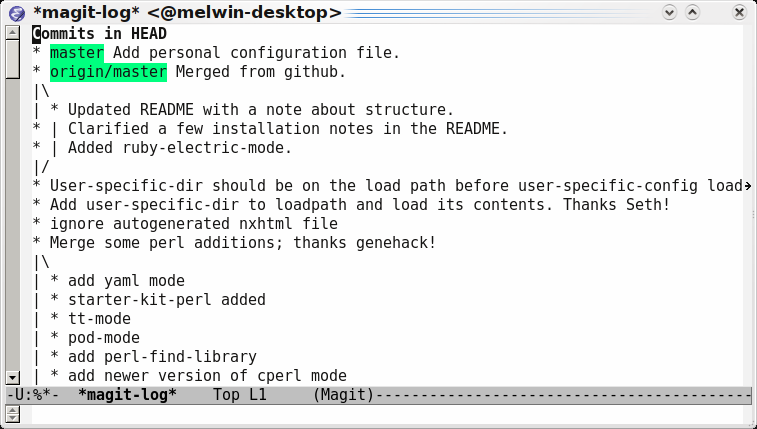 Depending on your internet connection, this could take quite a while, as we need to download the texlive distribution, among other things, to build all of the Git documentation. This is not strictly necessary, but here we’ll just do it for completeness’ sake. Compiling Git will take some time as well. Go get a coffee (or perhaps a Pan Galactic Gargle Blaster - sweet like nectar). Let’s add it to the user’s path by linking it into the private bin directory. This depends on the standard Ubuntu bash shell profile script which adds ~/bin to the PATH variable. If a different shell is used you need to perform the appropriate steps yourself. If you get the above output - great! You’re don! Sit back and relax for a bit before moving on to the next section. However, if you don’t get the version output, but instead see the following message, review the previous instructions and make sure it works ok before continuing. #INCORRECT OUTPUT - SOMETHING WAS MISSED! If you still can’t get it to work - drop me a comment! There are loads of good Git tutorials and information. You can find several on the official Git page and at GitHub (go sign up if you haven’t already, and fork me!). ~/gittest$ git commit -m "Initial import." [master (root-commit)]: created 79c091d: "Initial import." ~/gittest$ git commit -a -m "Add new line." [master]: created b20f9a4: "Add new line." If you can follow the above - great! First part finished. 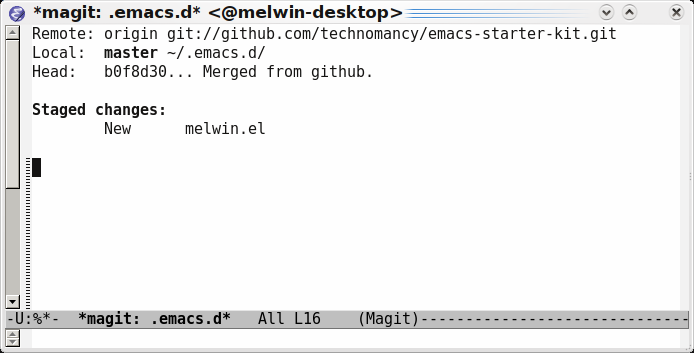 Next up is to install GNU Emacs from source and the emacs-starter-kit, which provides a decent default a set of configuration for Emacs.